With our first event coming up this weekend, I began to doubt if we would be able to squeak in a XC schooling. I figured that, with us doing Starter, May and I would be totally ok. However, I got a text around 2PM asking if I would be open to going schooling instead of a lesson. All of NT’s lessons that afternoon were going to the show, so it was easy enough to organize a quick XC schooling. The joys of being in KY, this venue was only a 3 minute trailer ride from my barn! We were able to throw everything on the trailer and get going by 6PM, which for us, is a huge accomplishment. We figured we had until at least 7:30PM before the light got too dim to get anything accomplished. 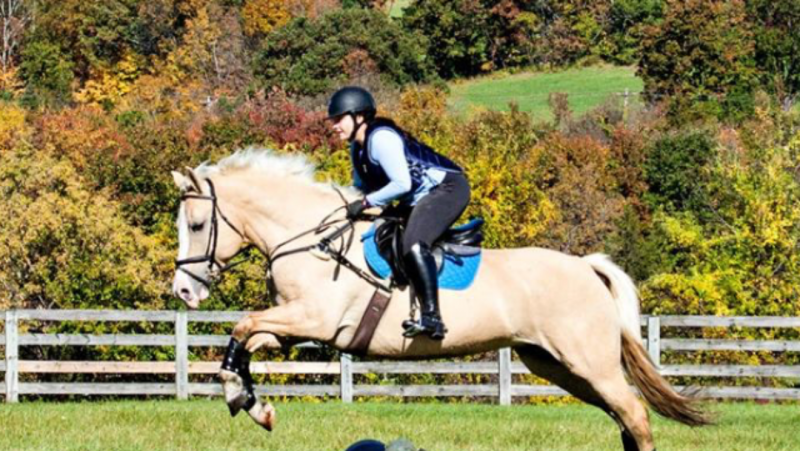 This was my first time going XC schooling with NT, so I wasn’t totally sure what to expect. I quickly learned that NT has a preference for putting together courses vs. schooling individual elements. Part of this is probably due to the fact that we had 3 fairly experienced horses with us. (May and one of the geldings have both gone BN, annnnnd the other gelding had done a 1* haha). However, the courses were built to be inviting at first and harder after you got your groove on. The first course, NT started out really easy on me and May. We went over a little baby log, popped over a house in the shade, down the hill to a little roll top, over a bigger coup, and finished up over some stacked logs. Feedback? I needed to ride a bit more forward. NT had us go out again, but told us to take the BN option at the end. Other than getting left behind a bit at jump 2, where I totally didn’t trust the big spot in the shade, it rode great! The next round, we started with the starter house, over a larger house, down the hill, through the brush, over the ditch, up the coop, over the BN open oxer, and finished through the 2 stride line. This was kind of a funny line because the height was BN, but the question was not a BN question. I was really happy with our execution of this course! (and the ditch was a complete non-issue.) I was really guarding against the right shoulder drift through the two stride and probably was a little too aggressive, and I ended up riding her a bit left through the combination. Either way though, she jumped FANTASTIC over the out brush. At this point, I was kind of dying. I somehow developed a pretty nasty sinus infection that came to a head yesterday, so my ability to get breath into my lungs was severely comprised. I actually felt a bit dizzy and overall just not great. I decided at that point to forgo any long courses. We didn’t need a repeat of last week, and May felt great! We moved on to the “water” complex… which hadn’t really been filled with water for the year. Oh well, we splashed through the puddles and then practiced the banks. Again, NT asked me if she cared about ditches. My response? “Nope, but she’s going to make me a liar if you keep asking.” Luckily, she didn’t! First we came down the bank we did at last year’s starter event at this venue and then up the out bank of what should have been the water complex. We then looped around and came back through. Not super surprising that May just popped right through it. The part of this exercise that was caught on video was better than the beginning. May wasn’t super thrilled to be trotting over the rocks of the water complex with no water in it. Oh well. Still adorable. The last exercise we participated in was working on terrain in less than ideal footing. The footing was considerably deeper in this field than the other one, and there were some good patches of mud. We worked on coming up and down a steep hill and then over a little roll top. Issues? Nope. Overall, it was a really fun outing. It feels great to be a part of a barn team again. In every video, you can hear people cheering and egging us on. It was a beautiful night, and I am super excited to show this weekend! I kind of hesitated yesterday when I posted the “fail” part of the lesson first. To be honest, it was one of the best lessons May and I have had in a LONG time, and it would be pretty short sighted to define the whole lesson by 18 seconds. Either way though, I knew that the rest of the lesson needed its own post! The inspiration for the lesson was a grid that Lainey Ashker had shared on her instagram. In fact, my trainer said that she really thought of May with this one’s focus on a horse jumping over their back and really sitting before fences. Obviously… we didn’t jump it that big. We started with the two oxers practically on the ground, and we first worked from the longer approach into the grid. We nailed it a few times in each direction before trying it the other direction. The short approach off the left consistently caused issues, so we decided to keep working on that turn before each course. The nice thing about the grid was it forced you to set your rhythm early and then maintain it throughout the course. The course came through the grid off the short approach, a sweeping left turn to a narrowish oxer, 6 or 7 strides bending line to another oxer, long approach to a vertical, finishing with a right turn around to a wide oxer. Our first time around the course was just a bit choppy. Obviously, I missed coming into that grid (story of my life). She didn’t really respect the small, narrow oxer at 2, so just kind of rolled past my half halt. I was thinking seven through the bending line and it was fine, but maybe a touch tight. The vertical was fine. Then I made some weird line decision to the last oxer? Like got ahead of myself, came off the rail, didn’t see a distance, and just kind of puttered over it. None of it was TERRIBLE, but it wasn’t good. NT raised up the narrow oxer to more like BN height (I think? ), and we tried again. To me, that shows big improvement! I was able to make adjustments to the oxer to oxer line, a better distance made the 6 really easy. I landed off the oxer line and rode… really forward? Like what I am thinking in this picture? So I had to whoa pretty good coming into the vertical, so May didn’t get her lead. She DID end up fixing it before the oxer, but the counter cantering pushed us off our rhythm juuuuuust enough to mess up the distance. However, I rode forward and she gave me the long spot. Yay! At this point, the camera died, so no more media hahaha. Our last course was the gymnastic, right turn to the pink (set a bit bigger), right turn bending around to the yellow and black oxer, right turn to the purple and blue plank we hadn’t jumped yet and finishing over the oxer to oxer line. However, I rode forward after 2 and had a GREAT distance to 3. The loop to 4 was easy, so we turned before the gymnastic to get back to the oxer to oxer line. Seriously, as much as I get weird feelings about oxers, I LOVED that oxer to oxer line all day. All in all though, it was a really great lesson, and I feel good heading into Spring Bay in like 10 days! Remember when we were all talking last week about how great it is to get media? I do! So on Tuesday, I strapped my helmet cam to my helmet and set off for my jumping lesson. With a freshly dragged ring, a new course set up, and temps in the mid 50s, it should’ve been a perfect lesson. In a lot of ways, it was. We jumped higher. I felt more confident, and I did a lot more jumping than I had been able to handle in my last lesson. Then we had a quick conversation where my trainer said, I just want you to do the grid one last time, so you can really nail that turn. Sooo what happened? I never got straight coming around the turn. May has a bad habit of falling through her outside shoulder and in my desperation to get a better distance to the first jump, I sacrificed my line. By the time we were over the first fence, we were already practically outside the grid. May, bless her heart, tried to correct it, but she realized (as did I) that there was no saving it. She scrambled right and stopped, and I just went over her shoulder. Hey May – The grid is over there! She sorted it out, and I got back on so that she could teach me how to manage it. Three more times through the grid with good results, and we were done. Today, I am bruised and sore. My elbow is skinned. But honestly? I kind of feel BETTER now that the “worst” has happened. I fell off because we made a mistake. I am fine. She is fine. And overall, we had a great jumping lesson. More on that soon! Is this a thing? I think it’s a thing. Hold on, let me explain. During my lesson this week, I was convinced the jumps were HUGE. Ok, not huge, but “a good size”. That they required effort from my little horse, an accurate ride, and that they needed a healthy dose of respect. Do you know what I see? some pretty small jumps… Not that I shouldn’t aim to ride them properly but… less than ideal distances, lines, and pace wouldn’t cause us to crash or have any significant impact on May’s confidence. It would just make them ugly. Somehow, my brain had convinced me that I had something to fear from these jumps, from this course. As I made my way to start each round, I felt my chest tighten and my legs go weak. Even know, I can feel that drowning feeling that I get before any show jumping round. Baby Jump – Major heart attack. Leg on. Always. Having pace bails me out of a lot of issues, so I ride forward… almost to a fault at this point, since a couple of distances on Tuesday would’ve been fine if I had just sat pretty. Luckily, my internal metronome hasn’t gotten slow on me. Riding with a neck strap. This lesson, I made the decision to ride with my neck strap. I promised myself that, if I started to feel the UNDYING need to pull, I would just hold onto it. I will say that I am a bit proud of not grabbing it. Getting media. I think this helps. It puts everything in perspective. And, honestly, it helps me remember. When I get this nervous, I go blank. My memory goes BLACK. I remember showing as a junior and not remembering ANYTHING about a course as soon as I finished it. I was never the brave kid hahaha. That being said, I should break the habit of going back and watching the whole thing in slow-mo, so that I can judge every millisecond of myself. But I really want to move past the management of these feelings and hopefully banish them away for good. Any recommendations of good sports psychology books or things that have helped you? So yesterday our weekly lesson was a jumping one. One I was REALLY excited about. May has been feeling great since she got her hocks injected, and I was looking forward to trying the upgrade over some fences. I even threw on May’s breastplate and neck strap because I started a new rule for myself: I cannot ask my trainer to lower fences. She sets them – I ride them. Buuuuuuut I took a new fitness class on Monday night. My spin class instructor had recommended that my friend and I try the new piloxing class. “It’s a mix of pilates and kick boxing. You’ll love it!” In my head, this meant that it would be cycles of kickboxing to get your heart rate up, followed by sets of Pilates exercises. Right? NOPE. It was 45 minutes of NON STOP, HIGH IMPACT CARDIO… my least favorite thing in the world. We got 10 second breaks every few minutes, but the goal was to never let our heart rate come down? No clue, but half the class left mid-way through. The result? I was damn near crippled before my lesson even started. This feeling of overall stiffness and lack of strength definitely didn’t help my confidence, but I promised myself that if I got nervous and felt myself riding backwards, I would just grab my neck strap. The lesson started out simple enough. We just did a figure 8 over a vertical with maybe 15M circles crossing over the jump. At first, the jump was set at maybe 2’3″, but after a few reps, my trainer raised it to around BN height. It was actually significantly harder to ride at the smaller height. May just didn’t respect it and wanted to add the extra stride whenever possible. Then, the first time the height was raised, I overcompensated and pushed her really ACROSS the jump… and blew past our turn. Once we had it figured out, it ended up being the perfect exercise to get us in the right rhythm and balance for our course! This lesson was really about building a course, so our first course ended up being the first half of our second course. The course was over the single natural, left turn before 4A to get to the oxer (2), right turn to 3, seven strides to 4A and 4B. 4 was a one stride combination. Before my round, NT noted that since the jumps were small, I would likely get 8 strides from 3 to four. However, I was not allowed to get 2 strides in the combination. Cool. Well – I never got straight to one, so we added an extra step there. Two rode great. My turn to 3 was a little funky, but I kept her with me and she jumped across it nicely. I kept that forward rhythm, and we got down to 4A in seven easy strides. As a result, the combination rode really well. Yay! We caught our breath as NT raised some jumps. Our second course started with the first course. After 4B, It was a squared off left turn to 5, bending to 6, a fairly tight turn to the oxer at 7, and then a SLIGHTLY bending line to finish over 8. How’d it go? Well check out the video below! Jump 1 rode better this time, despite me almost running over the dog. 2 was easy, but she felt a bit behind my leg. I moved her forward around the corner to 3 and she jumped that great. Then I kind of definitely overrode the line to 4A. After 4 strides… I realized I was in danger of doing 6 and taking a flyer into the combination. A quickly half halt and we got in on a short stride, but not a total ship or flyer. Obviously, the one stride rode great after that. NT warned me that everyone had been messing up the corner to 5, so I made sure to square it off and ride her shoulder through the turn… Then instead of bending to 6, I rode STRAIGHT to it, resulting in an awkward chip. Oops. My turn to 7 was great, and the five strides to 8 was easy peasy. After, we were both out of breath. May had a busy weekend going to the combined test with her half leaser (they finished on their Dressage score! ), and whatever was left in my muscles had left around jump 6. So, I decided to call it a day on that. While my body is even MORE sore today (anyone ever been woken up at 3AM by their own soreness? ), I can’t help but bask in a successful jump lesson. This post is long enough, so more fun updates coming later this week! Typically, my lessons are on Tuesday nights, which tend to be unusually quiet at the barn, and honestly, I love that. By the time my lesson is over, the barn has mostly cleared out, and I get some quiet time to reflect on my lesson, pet my pony, and just relax. However, this week my lesson was on a Wednesday, sneaking it in right before NT spends a couple of weeks in Aiken (so jealous!). This week, I pulled into the driveway to see a few horses tied to trailer by the indoor. Not thinking much of it. I got May all ready for a Dressage lesson. Since May has done a lot of jumping lately, I wanted to reestablish our connection and get some homework while NT was out of town. So the white boots and pad went on, I threw on my new spurs, and I headed out to the indoor. I got halfway there when I saw a white ball fly past the entrance, followed by a HERD of polo ponies. Alright then… outdoor it is! While it was pretty warm (in the 50s and I ambitiously rode in a t-shirt because I only had heavy jackets and fleeces in my car), it was WINDY and CLOUDY. Since May had a fairly easy few days after last week’s jump-heavy rides, she was a bit up. Plus we were in the outdoor, with the jumps! And the polo team was in the indoor right next door to the outdoor. While May couldn’t really SEE them, she could definitely HEAR them. I had a few minutes before NT headed to the ring, so I started with my usual “my aids mean something and you need to listen” routine. So we walked on the bit, and we halted. I try to be REALLY methodical about my aids when she’s like this, so I shifted my weight back, engaged my core, halted my seat, closed my thighs, and then rocked my hands back. So then I pulled, and she threw her head up and halted. So we walked again, and again, I shifted my weight back, engaged my core, halted my seat, closed my thighs, and then rocked my hands back. And she slowwwllllyyy came to a halt. I let her move forward again, and repeated it in the other direction. After 3 – 5 repetitions, she is tuned in. So at that point, we can finally trot. The trot was still a bit tuned out, so we just did big, loopy figure eights. I asked her to move off my legs and flex through her body. Buuuuut I actually don’t think this is still the best method of getting her to tune in at the trot. The walk/halt stuff is super important. And Trot/walk/halt tends to make her more tense instead of less. BUT NT to the rescue. I told her that May just felt really tuned out, so she had us trot and just work through our gaits within the gait. So we started with working trot, then stretchy trot, then working trot, then collected, then working etc etc etc. By the time we rotated to her “bad” side (going to the right), she was on my aids and listening. The right bend has gotten SO MUCH better. Once we had all three variations of trot nailed down, we moved into the same exercise at the canter, but replaced stretchy trot with a medium canter. My left lead transition was really good. She was actually a bit sticky off my leg to go into the medium, and that stickiness created some struggled at the collected canter. You know how I knew when we got the collected canter? May GRUNTED. She sounded like me mid spin class when I realize I have another 20 min to go and the instructor says we are going to “ramp up the resistance”. UGH. To the right, I was not surprised to get a little more resistance with some head tossing and breaking down to the trot. Ultimately though, we did get a few steps of true collection, so that was pretty cool. Finally, we moved onto a serpentine exercise. Trot across the short side of the arena, turn left, do a 10m half circle, trot across the short side, turn right, do a 10m half circle etc etc etc. All the way to the end of the arena and then back. Given that there are a TON of jumps in the ring, I had to get a bit creative with my half circles. However, by the end of the exercise, May was the most connected and steady in the connection as I have ever felt her. She was tracking up, in front of my leg, and I felt like we could spring forward or halt dead with ease. So when we finished the exercise, and NT said to do it again at the canter with simple, trot changes in between, I was super excited. The first half circle to the left was GLORIOUS. I really felt her step under herself and bring her shoulders around. Then we went right… and it was a little messy. I sat back further. I added more leg. I engaged my seat more… but she was clearly over it. We managed to mostly pull it together to finish, but it was clear she was tired, and it was really hard. While it wasn’t perfect, it definitely gives me a great set of things to work on while NT is away, AND it gives me a great baseline before her injections on Saturday. Do you have a specific routine you go through that helps your horse settle into work? In last week’s Dressage lesson, we worked on adjust-ability. The vat majority of the lesson was spent on a 20M circle, pushing May forward and then bringing her back. Asking her to extend and collect, and in general, getting her more sensitive to my aids. It was a great lesson where NT and I were able to work through some issues I had been having and the result was a fairly elastic and on-the-aids horse. Good stuff! But I was decided, our next lesson (weather permitting, which is almost never does anymore) would be a jumping lesson. Then… some pics popped up on my timehop. (anyone else still using that app?) These pics were the worst moment of my not-so-great SJ round at my first and only recognized BN horse trial. I would post them… but they are the photographer’s photos and not mine to share. However, I do have the video. I looked at the pictures… and I watched the video. I laughed with some friends about the video… like, those fences don’t look SO big now (jump 3 is where the pics are from). Then I watched it again… and maybe a few more times. I am sure there are more objective people who can point out a million issues to me. But the one that stands out is the fact that, up until the refusal, that horse is not in front of my leg. SURE we moved up to the first fence, but it was more that I was turning and gunning than riding a forward rhythm and balancing when necessary. Then I thought about my last lesson, which was inconsistent and scrambly. You know, the one where May chipped in so bad that I almost fell off. She was forward at the end… but not consistently in front of my leg. So when I showed up for my lesson, I warmed up with one intent: to get this horse in front of my leg. Transitions were sharp, and I didn’t hesitate to use my bat when my leg didn’t prompt her to SPRING forward. NT came out to get our lesson started, and we decided to start on the one stride exercise. It was set up across the middle of the arena, along the short side to allow for square turns towards it, and then a square turn after. The cross rail set you up for straightness, and then the ride had to maintain the straight and forward over the narrow jump at the end. Honestly? It felt pretty easy. We had no issue converting from the two stride to the one stride. Although, May thought that turning and going forward should be mutually exclusive activities. Since that went well, we moved onto our first course. The gymnastic, right turn, diagonal, six bending strides to the vertical then seven strides to the oxer… I made NT make the oxer smaller, and then I informed her that THAT was the LAST time I would be allowed to ask her to make anything smaller. The one strides went great, and I made sure to really square off the turn after the last element. The right turn was pretty tight to jump two. (May and I ended up in the tree a bit in that corner). I felt like I lost my rhythm a little bit around the corner, so despite jumping well over 2, I still pushed down the line… and straightened the line… and got to the 3rd jump in 5.5 strides instead of 6… Oops. Despite the extra stride, we were still ROLLING to the oxer. I gave a strong half halt, steadies and FIT IN the seventh stride a bit shorter than the earlier six. I asked May to halt instead of blowing me off. I walked back to my trainer. Who… I think was trying not to laugh. Not because it was bad, but because the hoof prints of my line from 2 – 3 was a solid 3 – 4′ INSIDE the track laid by the lesson before mine… OOPS. “Go forward or straighten if you need to make up distance… don’t panic and do both.” Right Right. I tried again, and nailed it. I even managed to halt a couple of strides after the oxer pretty easily. Win! So we put together another course. Gymnastic, LEFT TURN, to oxer, RIGHT TURN to vertical and six strides to diagonal. So I started by doing a thing that I shouldn’t do. I made the turn to the gymnastic, and pushed May riiiiiiight past the distance. Oops. The rest of the gymnastic went well. The turn from 1 to 2 was a bit rough because May was anticipating the right turn, but I kept my leg on and it was fine. The oxer rode GREAT…. Then I yanked on the right rein and almost went right over May’s left shoulder in my attempt to turn right. Whoops. Smoothed it out and May skipped over the last two fences. So we made the oxer and the vertical a bit bigger. NT had me make the turn to the gymnastic inside of the puddle to try and get me to stop pushing past the distance (WHO AM I?) The turn was better to the oxer (which rode AMAZING). The right turn after the oxer was better too! Then…. I stopped riding to the vertical… and my merry mare skipped over it. The last fence worked out fine then. Enjoy that vertical fail below. I tried it again… and basically did the same thing. THEN I TRIED IT AGAIN. Committed to the damn thing, and it was perfect. We ended on that, and May got stuffed full of cookies. It feels GOOD to be back in a program. Last night, I had my first lesson in… a while. Anyone else sick of hearing me say this? I AM sick of hearing ME say this. I had originally wanted to take a jumping lesson, but the flooded status of KY in general, ridiculous winds, the threat of MORE rain, and a dropping temperature meant that I decided on a Dressage lesson instead. The barn was oddly quiet last night with just me and NT around that evening, so our lesson was a bit more casual than usual with lots of chatting and catching up on the state of May. (Future injections, 2019 plans, etc). I’ll probably write about the lesson tomorrow, but suffice to say, we have both seen a lot of progress thanks to her help this past fall and the work my half leaser has been putting in. So I started looking back. What made May and I capable of moving form starter to BN in 2016? How did we get to the point where we were schooling Novice sized SJ course with relative ease that summer? I remember this being fun. It wasn’t because I was younger (26 – 29 is not a huge jump… unlike 22 – 25 which seems MASSIVE). It wasn’t because I had access to a better trainer. (There are some serious similarities between NJ trainer and NT.) It wasn’t because May was more educated. It was because I was in a regular program… and I haven’t been in one since. Then in 2017, I had committed to lessons with my trainer at the time, but due to a job that had me traveling and her own schedule, we would average maybe 2 lessons a month… at best. Money was still tight, I got married in mid-summer, and the lack of competition goals meant that again, lessons fells to the back burner. 2018… I moved barns in mid competition season, but I still made it out to a couple of shows to get our feet wet again. (Literally and figuratively). Lessons started up again, and I was surprised at how much I felt like a fish out of water. My whole riding career had been focused on weekly lessons (and catch riding). Here I was, on my own horse, and feeling odd about lessons. Then this year… I find myself really prioritizing lessons. So, for the first time since Spring of 2016, I have put myself into the weekly lesson rotation schedule. Fingers crossed that this has really been the missing link in my confidence lately! So I really want to know – Are you a “weekly lessoner” or more of a “when I need them” or even a “don’t need no trainer” type of rider? It had been MONTHS since my last jumping lesson. Actually, I just looked back and… Yup. It has been FOUR MONTHS… which makes it the fourth jumping lesson of 2018. BUT that also means that I got TWICE as many jumping lesson in during 2018 than I did in 2017. That counts as improvement, right? After warming up, we started trotting through a fan of poles at the end of the ring. It was similar to the exercise below, but there were four poles and they were just on the ground. I had a lot of trouble to this going to the left. May really wanted to fall out through her right shoulder, and I felt like I couldn’t quite keep it in the line I wanted. Definitely something to work on. The canter was somewhat better than the trot, but May kept wanting to jam in an extra step before the last pole (keep this in mind). Going to the right, the exercise was a lot easier, because all I had to do was regulate how fast her right shoulder came around… a lot easier than trying to pull the right shoulder in and around. Four verticals, one oxer with 2 placing poles. To get May moving forward and get me riding a line (the whole purpose of the above set up), we started with creating a circle from the yellow vertical to the green. In both directions, I messed up either my line or my rhythm the first time, but totally nailed it the second, so we didn’t spend much time on this. Then we moved onto the full exercise. The verticals are set exactly 4 strides to the placement poles and the placement poles are one stride from the oxer, so as long as you take a fairly direct line but jump all the elements straight, it is 5 strides from each vertical to the oxer and the oxer to each vertical. A couple more notes about what makes this a bit unique. Our ring is not 100% flat. It angles slightly towards the barn, which means that coming towards the barn things are easier than going away from it. This totally becomes relevant, I promise. An old pic of the ring. NT tells me that I am most likely going to get a forward 6 to the fences and trying for the 5 will likely leave us too unbalanced to do the exercise correctly. Doing 7 will either leave us dead in the water or on too wide a line. I nod, and then immediately tell her that I feel nervous. She gives me a funny look. Our first course went in this order: Green, Blue, Red, Orange, Blue, Yellow. I ride the green perfectly with a great pace… Then I take a feel coming towards the oxer, and May adds an extra stride. This means we are kind of dead in the water and we add again to the red… BLAH. I kick on, but the orange and yellow kind of go the same way. NT notes that she liked my pace coming in, but I took my foot off the pedal once I had to actually jump and turn. She’s not wrong. We do it again. The Green, Blue, Red combination goes REALLY well, and I am feeling good. BUT remember that the ring slopes down in that direction… I ride the Orange pretty well… and then don’t kick enough towards the oxer. It’s a bit of a stretch for May to get over the placement pole, and instead of stretching AGAIN over the low, wide oxer, she shoves in an extra stride… takes down most of the oxer… I do manage to kick on and get 7 or 8 strides to the Yellow, so we finish… but not in great form. The oxer gets rebuilt, but I can almost feel May losing a bit of confidence here. I am DETERMINED to give her a positive ride. We change up the course a bit to keep May from anticipating where we are going. It was SUPPOSED to be Yellow, Blue, Red, Orange, Blue, Yellow. Buuuuut I forgot where I was going at the end, and I end up doing Yellow, Blue, Red, Orange, Blue, Green. Why do I forget where I am going? That’s right, because I still can’t get the distance from the Orange to the Blue to work out properly. I close my leg, but May keeps giving me this response like “this is as forward as I will go.” I am not sure if I am having trouble committing, or if she is just used to a different ride from my half leaser, but either way, she is going forward… but she is not in front of my leg. Proof that she can stretch for it. My trainer confirms that everything looked good, but May decided that she needed to make the final decision on that one. Again, a lot of this probably comes back to the fact that it has been 4 months since we had a jumping lesson and this set up was really difficult, but she had really just not been fully responding to my leg all night. I’m not sure who suggested it, but my trainer ran back to the barn to grab me a longer jump crop. Something I could reinforce my leg aid without taking my hands off the reins. As you can see, we were now starting on the line I was having the most difficulty with. ALL I WANTED was to get the first line right. We jumped in, I rode forward, we got 6! I turned to the green. Another 6! I rode forward to 4. Never got straight to it… and got down that line in 5…. Yup, definitely more in front of my leg this time. However, doing the five put us way too off balance for the Orange, so I had to bend it out a bit and I got 7. But it was SO MUCH better with the crop in my hand. May was taking me to the fences again, and I felt like we found our usual groove. She puffed herself up and pranced back to the middle of the ring. Either way, we nailed the bending line, and May came right back to a perfect dressagey-canter to bounce through the poles and then halted easily to end our ride. *I am going to add a note here. May HAS done similar things before when she loses confidence in me. The below video from Kent is a perfect example. After the combination, May was just DONE saving me, so we had a run out. Once I rode better, she went perfectly again. Today? I am sore and still feeling a bit back on the heels from the experience. BUT I am super proud of the fact that I didn’t give up in this lesson, and I didn’t decide it was just too hard for us. I kept riding, and I ended the lesson with a much more confident and trusting horse than I started with… even if things got REALLY messy in the interim. I will probably dissect my feelings a bit more in my next post. Until then, have you ever had a lesson that had to hit a pretty low LOW point before ending great? My first inclination was to say, “nope.” I think I actually did say, “nope”. Luckily, my trainer knows me better than that and gave me an extra 10 seconds to actually think about my rides lately. “Actually, I think we could use some work on transitions.” Doubly-Luckily, my trainer also knows what I mean by this. Yes, I can get May to halt/walk/trot/canter etc on cute, fairly promptly. HOWEVER, I wanted to work on keeping the connection and balance before, during, and after each transition. I know. Riveting stuff. Let’s not forget this halt to trot transition at our last horse trial… where May drifted about 5′ left for no particular reason. The majority of the lesson was spent on a 20 meter circle. We started with walk/trot/walk transitions. You know, the most basic of the basic. Positives? May stayed in front of my leg. Negatives? She enjoyed being in front of my leg and falling on her forehand. Solution? Change walk to halt. Our first trot/halt transition was met with her just dissolving onto her forehand. She practically took the last step in the stumble. It was super majestic and graceful. So NT had us back up a couple of steps and try again. The next time? May pulled a typical May move. Instead of falling on her forehand, she rocked back and halted… and then immediately backed up, away from the contact. How do you fix that? Rinse and repeat. Forward, halt, forward, halt. Eventually, we got the halt/trot/halt transitions so tuned in that I could do 90% of the movement with my seat, with barely any additional input from my hands and leg. Adding this to my goals this winter – get all transitions tuned into the seat. We moved onto the canter, but we changed up the rhythm of the transitions. We did a lot of trot, canter, trot, halt, trot, canter, trot, canter etc etc type of work. May started off running a bit into the canter, and I played into that by making my aids BIG and UNNECESSARY. We do not canter with our shoulders. However, by the end, I could just swing by seat, close my outside leg, and get a nice connected canter. Funny how that works. The lesson finished off with transitions on the quarter line. I had to work VERY hard to be clear with my aids and keep her straight and connected. I thought my brain was going to melt with how much mental capacity this exercise takes up. Is it weird that I can’t wait to try it again on my own? There ended up being a ton of nuances to this lesson, that I am still really digesting, but it filled up my tool box (and my motivation chest) with a lot to help us move forward this weekend! Are you setting any specific goals this winter?